Peanuts and peanut butter contain 25% of the Recommended Daily Intake (RDI) of Vitamin E, a vital antioxidant that protects the body's cells and tissue from damage and helps the immune system. Peanuts and peanut butter contain 19% of the Recommended Daily Intake (RDI) of Niacin, necessary in more than 50 of the body's processes. Peanuts are a good source of folate, which can reduce the risk of certain birth defects in the brain and spinal cord. The peanut plant originated in South America. Peanut butter was first introduced to the USA in 1904 at the Universal Exposition in St. Louis by C.H. Sumner, who sold $705.11 of the "new treat" at his concession stand. The patent for peanut butter was awarded to Dr. John Harvey Kellogg in 1895. 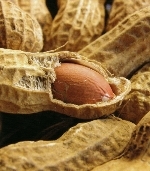 The peanut is not a nut, but a legume related to beans and lentils. Astronaut Allen B. Sheppard brought a peanut with him to the moon. Peanuts contribute more than $4 billion to the USA economy each year. Ever wonder where the term "Peanut Gallery" comes from? The term became popular in the late 19th century and referred to the rear or uppermost seats in a theater, which were also the cheapest seats. People seated in such a gallery were able to throw peanuts, a common food at theaters, at those seated below them. It also applied to the first row of seats in a movie theater, for the occupants of those seats could throw peanuts at the stage, stating their displeasure with the performance. As early as 1500 B.C., the Incans of Peru used peanuts as sacrificial offerings and entombed them with their mummies to aid in the spirit life. Adrian Finch of Australia holds the Guinness World Record for peanut throwing, launching the lovable legume 111 feet and 10 inches in 1999 to claim the record. Peanut butter was the secret behind "Mr. Ed," TV's talking horse. The world's largest peanut butter and jelly sandwich was created in Oklahoma City, OK, on September 7, 2002 by the Oklahoma Peanut Commission and the Oklahoma Wheat Commission. The PB & J sandwich weighed in at nearly 900 pounds, and contained 350 pounds of peanut butter and 144 pounds of jelly. The amount of bread used to create the sandwich was equivalent to more than 400-one pound loaves of bread. Now that's one giant sandwich! Arachibutyrophobia is the fear of getting peanut butter stuck to the roof of your mouth.